Willie Nelson plays Avila Beach this week. The Pixies play SLO Town on one of four warm-up dates before their European tour. A couple of nostalgia acts—The Doobie Brothers and The Monkees—perform in Paso. Alt-rockers Jimmy Eat World plays SLO’s Fremont. Retro American and blues act Reverend Peyton’s Big Damn Band also plays SLO this week, as do The Purple Ones delivering their Prince tribute. It seems like week after week SLO County keeps pulling in huge acts, but this windfall is soon to taper off as the outdoor concert season comes to a close. For now, get ’em while they’re hot! WILLIE & TRIGGER: Country superstar Willie Nelson and his beloved Martin guitar, Trigger, appear at the Avila Beach Resort on Oct. 21. 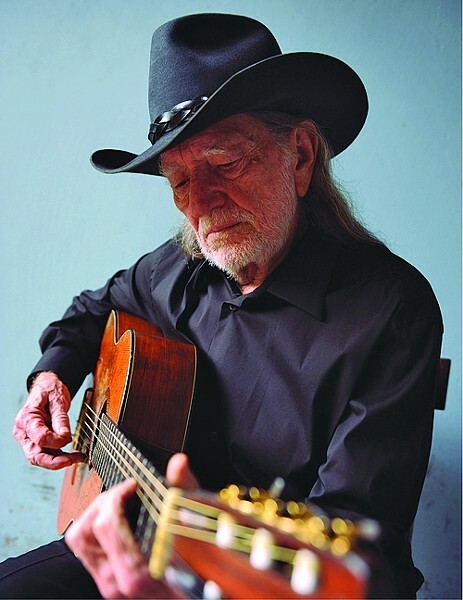 Otter Productions Inc. is once again bringing Willie Nelson & Family to the area, this time to play outdoors at the Avila Beach Resort this Friday, Oct. 21 (doors at 5 p.m., show at 7 p.m.; all ages; $50 to $110 at vallitix.com or 1-888-825-5484). My weather app says it’ll be a sunny 82 degrees, dropping to 56 in the evening. Willie’s got so many great songs, everything from “Hello Walls,” “Pancho and Lefty,” “Whiskey River,” and “Blue Eyes Crying in the Rain” to “Angel Flying Too Close to the Ground,” “On the Road Again,” “Crazy,” and “Always on My Mind.” You never know what he’s going to trot out during these concerts, but you can bet you’re going to recognize a lot of the songs. Over his six-decade career, he’s sung his hits so many times that he finds new ways to make them fresh. I love his records, but his live show is always something special. He’s 83 and slowing down a little, but he’s still playing Trigger, his 1969 Martin N-20 guitar that he’s strummed a hole through. You know the old adage, “Live every day like it’s your last?” Well, I like to listen to every Willie concert like it’s my last chance to see him live. Joe Koenig will open. 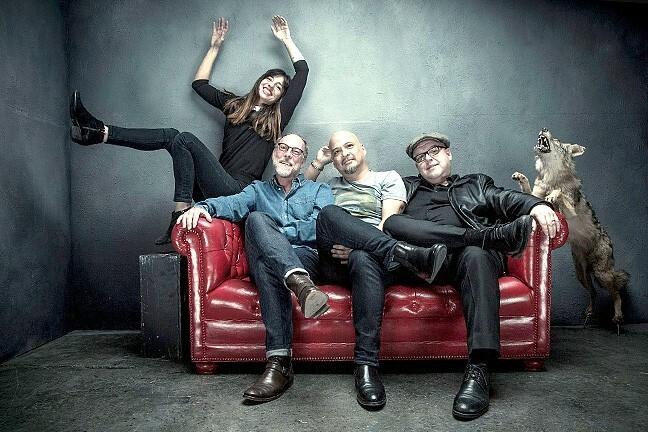 LUCKY US : The Pixies—(left to right: Paz Lenchantin, David Lovering, Joey Santiato, and Black Francis) play the Fremont Theater on Oct. 27, one of four West Coast warm-up dates before their European and UK tour. Remember when Todd and Korie Newman managed to get Neil Young to play SLO Brew before the release and tour of his newest album? Well, the couple behind Good Medicine Presents has done it again, this time with alt-rock icons The Pixies, who will play one of four West Coast warm-up dates before their world tour next Thursday, Oct. 27, in the Fremont Theater (7:30 p.m.; all ages). The bad news is the $35 ticketfly.com tickets are sold out, but if you’re a rich eager beaver for some loudquietloud music magic, after-market sites are scalping tickets for between $135 and $226. How bad do you want to see the band that led the way for the likes of Nirvana and Pearl Jam? Expect stripped down production that will harken back to the band’s early, raw urgency as they play a mix of classics and tracks from their newer material. While we’re talking Good Medicine shows, they’ve got a few this week starting on Friday, Oct. 21, when local act One Time Spaceman plays Tooth & Nail Winery (5:30 p.m.; all ages; free) to play their genre-hopping sounds spanning rock, blues, country, surf, punk, bluegrass, reggae, funk, and soul. “We pull from a huge catalog of original songs and a deeply varied selection of covers,” said frontman, guitarist, and songwriter Mark Adams, who’ll be joined by Dylan Johnson (bassist, vocalist), Chandler Smiley (drummer), and Jacob Odell (guitarist). Good Medicine and Numbskull team up to bring melodic punk institution Face to Face to Sweet Springs Saloon on Friday, Oct. 21 (8 p.m.; 21-and-older; $17 presale at ticketfly.com or $18 at the door), with My Modern Valentine opening. Face to Face recently returned to Fat Wreck Chords to record their ninth studio album. 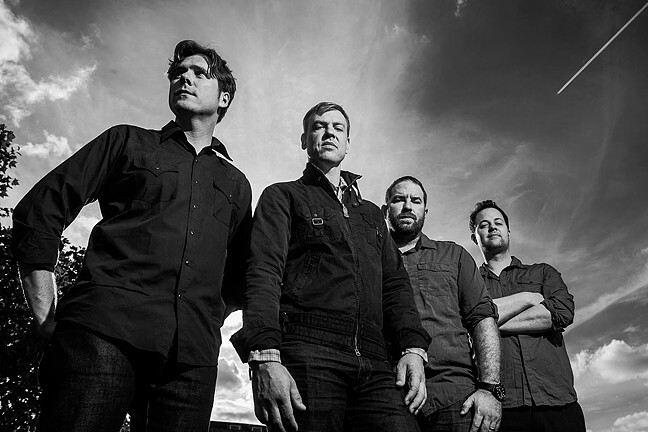 BLEED AMERICAN: Hit making rock act Jimmy Eat World plays the Fremont Theater on Oct. 24. On Monday, Oct. 24, Good Medicine and Numbskull team up again to bring Jimmy Eat World to the Fremont (7 p.m.; all ages; $32.50 presale at ticketfly.com or $35 at the door) with The Hunna opening. Jimmy Eat World, the multiplatinum Mesa, Ariz., rock act, recently released their ninth studio album, Integrity Blues, on RCA. The Hunna, which formed just a year ago, released their debut, 100, that made the Billboard Heatseekers chart at No. 36. You should also mark you calendars for country singer-songwriter Sam Riggs, who plays next Thursday, Oct. 27, at the SLO Guild Hall (7 p.m.; 21-and-older; $16 presale at ticketfly.com or $20 at the door); and Dee Dee Ramone replacement CJ Ramone (neé Christopher Joseph Ward, former bass players for punk icons The Ramones), who plays next Thursday, Oct. 27, at Sweet Springs Saloon (8 p.m.; 21-and-older; $13 presale at ticketfly.com or $15 at the door) with Johnny Madcap and the Distractions. Sounds like some punk rock fun to distract you from your inability to score Pixies tickets. 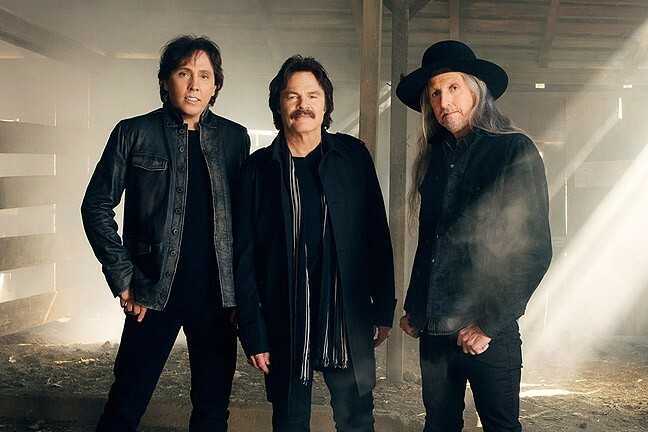 BLACK WATER: Iconic soft rockers The Doobie Brothers play Vina Robles Amphitheatre on Oct. 21. Vina Robles Amphitheatre is quickly closing in on the end of its concert season, and they’re going out with a couple great nostalgia acts starting on Friday, Oct. 21, with The Doobie Brothers (8 p.m.; all ages; $49.50 to 89.50 at vinaroblesamphitheatre.com). Formed in San Jose in 1970, they’ve had a number of incredible members, most notably Michael McDonald (1975-1982, 1995-1998, 2006), but their current lineup can perform their hits with aplomb. “What a Fool Believes,” “China Grove,” “Takin’ It to the Street,” “Long Train Runnin,” “Minute by Minute,” “Black Water,” “Listen to the Music,” “Take Me in Your Arms (Rock Me),” “It Keeps You Running”—these are songs I grew up on. If you’re too young to remember, do yourself a favor and discover The Doobie Brothers. Now I’m really dating myself, but I also have incredibly fond memories of watching The Monkees TV series (1966 to 1968). I was too young to realize the show was a money grab latching onto the popularity of The Beatles. Michael Nesmith and Peter Tork were the only actual musicians in the band, though Davy Jones could definitely sing and had done some musical theater, and Micky Dolenz had done some acting, most notably as the 10-year-old star of the ’50s series Circus Boy. They were a contrived act with two members who had to learn their instruments along the way, but the show was fun and the music was even more fun. LAST TRAIN TO CLARKSVILLE: Two of the original members of The Monkees (Micky Dolenz, left, and Peter Tork) play Vina Robles Amphitheatre on Oct. 22. 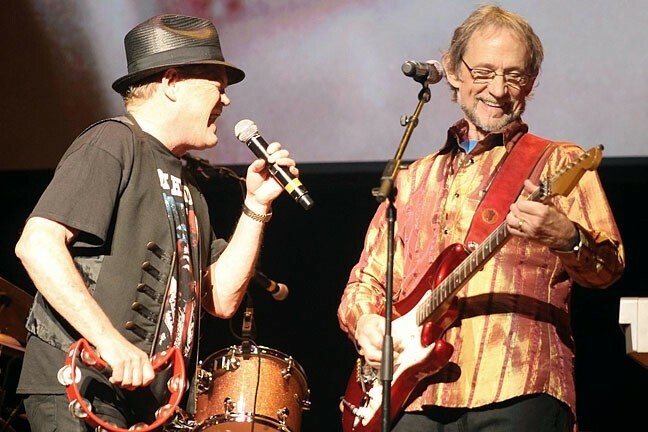 On Saturday, Oct. 22, The Monkees (well, two of them anyway—Micky Dolenz and Peter Tork) play Vina Robles (8 p.m.; all ages; $50 to $70 at vinaroblesamphitheatre.com). They have a new 50th anniversary album out, Good Times! DIRTY BLUES: Reverend Peyton’s Big Damn Band (pictured) shares the bill with Supersuckers at SLO Brew on Oct. 22. SLO Brew has four evenings of music coming up this week starting with Reverend Peyton’s Big Damn Band and the Supersuckers, who co-headline the venue on Saturday, Oct. 22 (9 p.m.; 18-and-older; $20 general admission or $50 VIP balcony at ticketweb.com). Reverend Peyton hails from the southern Indiana foothills, “playing a brand of Americana and blues that stands alone—Delta blues and hillbilly fervor combine with musical acuity [as] sharp as razor wire,” their bio reads. The awesome Supersuckers correctly bill themselves as “The Greatest Rock-N-Roll Band in the World.” True story! And to top it off, Texas country-blues-punk guitarist and singer-songwriter Jesse Dayton will open the show. Jesse filled in for Billy Zoom when he had to take a break from playing with X to undergo cancer treatments, and Jesse plays with John Doe’s solo outfit. On Sunday, Oct. 23, Eisley and Merriment play the Brew (9 p.m.; 18-and-older; $15 general or $25 VIP balcony at ticketweb.com). 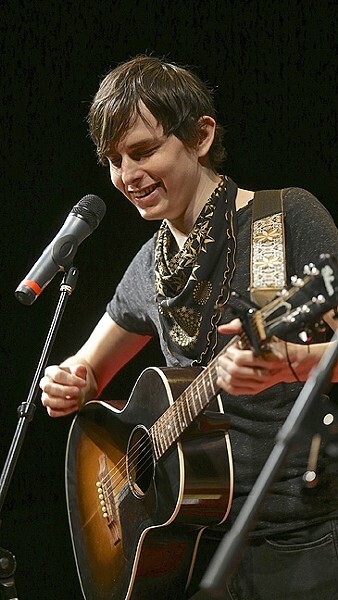 The indie-pop acts should complement each other nicely. PRINCE-ISH: Prince Tribute act The Purple Ones plays the Fremont Theater on Oct. 22 as part of the SLO Jazz Festival’s 2016 Fall Fest. Rockers Blitzen Trapper present Songbook: A Night of Stories & Songs at SLO Brew on Monday, Oct. 24 (9 p.m.; 18-and-older; $14 general and $30 VIP at ticketweb.com), with country folk artist Sera Cahoone opening. Perhaps the biggest act of the SLO Jazz Festival’s four-concert 2016 Fall Fest happens this Saturday, Oct. 22, when Prince Tribute act The Purple Ones plays the Fremont Theater (6 p.m.; all ages; tickets at 2016fallfest.com). SMITH SINGS NYRO: Arizona-based Adam Smith is one of several musicians participating in the Songwriters at Play Laura Nyro Tribute Show on Oct. 22 at the Steynberg Gallery. Music in the Round, a fundraiser for Paso Robles Youth Foundation & Youth Institute, comes to Tap It Brewing Co. on Saturday, Oct. 22 (4 to 7 p.m.; free, though donations appreciated for the beneficiary). Bear Market Riot, the Kenny Taylor Band, the Noach Tangeras Band, Matt Suarez & Friends, and Chris Beland will perform. Songwriters at Play presents a Laura Nyro Tribute Show at the Steynberg Gallery on Saturday, Oct. 22 (all ages; 7 p.m.; $15 at brownpapertickets.com/2594693). Nyro’s songs will be performed by a variety of local and touring musicians: Adam Smith (from Phoenix, Ariz.), Nicole Stromsoe, Jeanne Newhall, Shelby Figueroa, Karen Tyler, Holly Ann Lewis, Dorian Michael, and Steve Key. The Pismo Jazz Jubilee starts next Thursday, Oct. 27. I’ll tell you more next week, but find all the info you need at pismojazz.com/jubileebythesea.htm.